Our Solar System is no longer the largest known planetary system in the Milky Way – after scientists confirmed the existence of an eighth planet, Kepler-90i, around a Sun-like star on Thursday. The discovery was made after Christopher Shallue, a senior software engineer at Google, and Andrew Vanderburg, a postdoctoral fellow studying astrophysics at the University of Texas, USA, developed a machine-learning model to identify planets from readings collected by NASA’s Kepler Space Telescope. The convolutional neural network was trained to look out for periodic changes in the brightness of a star, which hinted at a nearby planet regularly passing in front of its parent star during its orbit. Scientists have known about Kepler-90, a star similar to the Sun located about 2,545 light-years from Earth for a while. The new finding is Kepler-90i, a small, hot, rocky planet with an orbital period of 14.4 days. 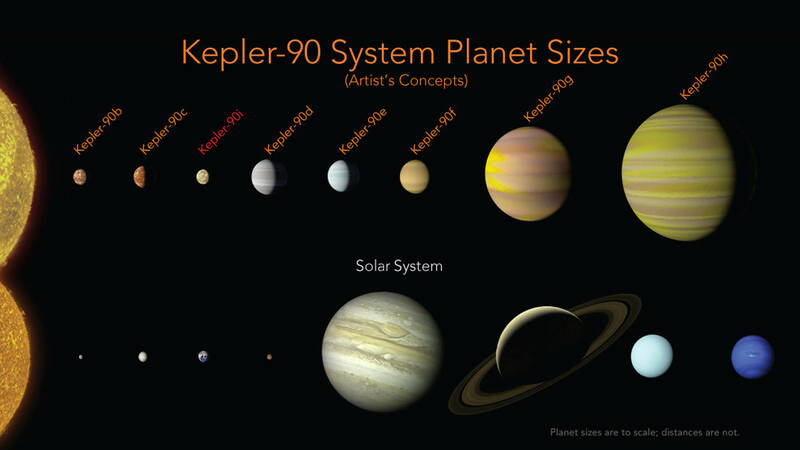 Its existence brings up the total number of planets in the Kepler-90 system to eight, the same number of planets in our solar system. The gang also found an Earth-sized planet called Kepler-80g in the separate Kepler-80 system. This exoplanet is locked together with four of its neighboring planets by their mutual gravity to form a “resonant chain”, similar to the seven planets in the TRAPPIST-1 system. NASA’s Kepler Space Telescope was launched in 2009 and specializes in finding exoplanets dotted around space. After four years it had collected a large dataset containing 35,000 possible planet candidates. A combination of computer software running automated tests and human judgement are used to verify the most promising results, but that means that the weakest signals are often missed. Shallue and Vanderburg believe the AI may be able to find candidates that have been previously ignored or overlooked in telescope data. Shallue said that in his spare time, he “started googling for ‘finding exoplanets with large data sets’ and came across the treasure trove of data from the Kepler mission." "Machine learning really shines in situations where there is so much data that humans can't search it for themselves,” he said. The neural network is trained on 15,000 signals from the Kepler dataset that have been previously verified as planets or non-planets. A smaller test set with new, unseen data was fed to the neural network and it correctly identified true planets from false positives to an accuracy of about 96 per cent. The researchers then applied this model to weaker signals from 670 star systems, where scientists had already found multiple known planets to try and find any that might have been missed. Vanderburg said the got lots of false positives of planets, but also more potential real ones too. “It’s like sifting through rocks to find jewels. If you have a finer sieve then you will catch more rocks but you might catch more jewels, as well,” he said. It’s not the first time machine learning and AI have been used for astrophysics research. There are several groups using it to find rare, ultrafast stars, hot Jupiters, gravitational lenses, and recover blurry images of galaxies.